How to flood a road | Notes from the U.K. I used to copy edit for a magazine whose editorial standards—I’m trying to be diplomatic here, and that’s never easy—were less than stratospherically high. (This doesn’t sound like it’s about floods, but we’ll get there. Stay with me.) Editing for them was hack-and-slash work whose goal was to create something marginally coherent. I’d clear out the irrelevancies, bolt in a few bits of basic grammar, then run like hell before the whole structure fell in. One day, because it was grammatically correct, I zipped past a sentence that said, “Water here has no choice but to run downhill.” I’d gone three sentences further on before I ground to a halt and thought: Wait a minute. What does water do someplace else? Stop and ask directions? I deleted it and I’ve gotten more than my share of laughs from it over the years. 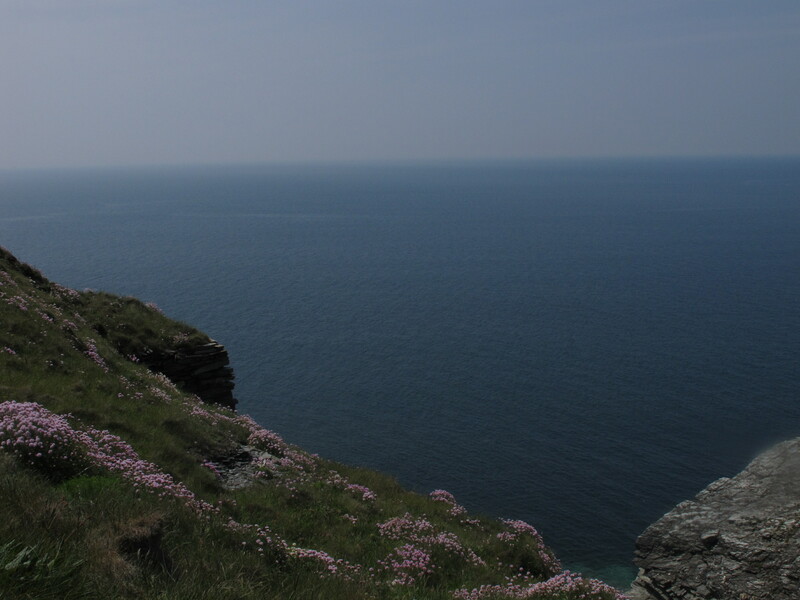 Irrelevant photo: thrift growing on the cliffs. Imagine how I felt, then, when I found out the writer really did know something, even if he didn’t say it in a way that gave the rest of the human race a shot at learning from him: The structure of the underlying rock in the area he was writing about—a part of southern Minnesota—doesn’t allow water to filter into the ground easily, so most of it runs off. It has no choice but to run downhill. Well, water in Cornwall (and possibly the rest of the country, but I don’t want to go out on a limb here) has no choice but to run downhill. Some of it filters into the ground, but less than I’m used to. During the time I lived in Minnesota, I saw a six-inch rain and a ten-incher. The streets flooded, the roof leaked, the neighbors got out hammer and nails and started building an ark, and our street, which I’d have sworn was as flat as an ironing board, turned out to have a dip where the water gathered and the parked cars bobbed around in the (literal) wake of a passing bus. Over by the University of Minnesota campus, two people canoed down the street. In north Cornwall, we can get that kind of drama (minus the canoe) out of two inches of rain. Or one if it comes down fast enough. Especially if it falls on saturated ground. And boy, have I learned to recognize saturated ground. So my definition of a heavy rain has changed. Even the rain gauge we bought here reflects that: In Minnesota, our rain gauge went up to six inches. Here, it tops out at two. What happens in a heavy rain here? Drive the back roads and you’ll see water pouring off the fields, often in small waterfalls. Wild Thing once saw it bubbling up through the pavement itself. Some of that water will flow into the ditches and through them to the nearest river and some of it, in the absence of a ditch or in the presence of a blocked ditch, will flow down the road so that the road itself becomes part of the drainage system. But before it gets to that nearest river I mentioned, some of it will form scenic little lakes in low spots on the roads, most of them shallow enough to drive through but a few of them deep enough to kill an engine. One rainy year, a low spot on the way into our village claimed two cars. The drivers either didn’t notice the flood until they were already in it (that happens surprisingly easily, especially in the dark or just after a blind curve) or they misjudged the depth. And when the water makes it to the rivers? They rise quickly. This is hilly country, and water around here—oh, I can’t help myself—has no choice but to run downhill. Even tame little streams can go feral and flood roads, houses, bridges, fields, villages, towns. Every so often a car gets swept off the road, and people drown. It’s nothing to fool around with. Wild Thing and I had to drive to Plymouth once just after a heavy storm, and the roads were flooded in several places. Wild Thing grew up in Texas and Oklahoma and is used to fords. She claims her parents had her wade across so they could see if it was safe for the car. She never did get swept away, so we can’t prove child endangerment. I’m guessing the water wasn’t as high as she thought, but I don’t know that for a fact. Me, though? I grew up in New York City and my idea of what to do when the water rises is go home and eat bagels. So even though I was driving, Wild Thing was the one who had to decide if we could get through. An orange traffic cone was bobbing around in one flooded bit, and I did have second thoughts about going through it. And third thoughts. But she swore we could get through and we did, in spite of how low our car is. By the time we came back, the flood had drained away and the Tamar—the river that separates Cornwall from the rest of the country, which had been out of its banks—had already dropped. The writer who taught me about water and choices might well have added that it also has no choice but to flow downstream. This entry was posted in Driving and tagged British driving, flooded roads, floods by Ellen Hawley. Bookmark the permalink. Read it, don’t just like it!!! Good advice–always. Thanks for the reblog. My parents used me as their water guage. Must be a Texas thing. Must be. We have 100% of our sample coming back as water gauges. And both survived. Reminds me of flash floods hereabouts. Perfect timing. We are under a flash flood watch today. We haven’t had significant rain since early June. I would think what dirt hasn’t blown out to sea would absorb the water like a sponge, but maybe it, the water, not the dirt, won’t have any choice. When people here talk about the conditions that lead to flooding, they mention first saturated ground and then dry ground. If the soil’s too dry it won’t absorb water and–you got it–the water has no choice but to run downhill. Sending you good wishes for the coming (or for all, I know by now past) storm. The most amazing thing I have ever seen was when a few raindrops, literally just a few, manged to flood the side streets of Las Vegas. Interesting image. I don’t expect they’re prepared for rain. It’s like any half-serious amount of snow in Britain: The country shuts down. It doesn’t happen often enough for them to bother preparing. And around us? It doesn’t have to be a half-serious amount. If it sticks, we go into panic mode. Envy! That’s what I feel reading this. I remember in the distant past (probably 1997) seeing water bubble up through the pavement. I loved it because it meant everything would be green, green, green for a long time and because that sort of natural happening symbolizes nature showing us humans that our constructs aren’t really that great. Back then I did not envision today–brown, brown, brown most of the time here on the central coast of California with forest fire smoke so strong in the air that I have to keep all the windows closed and that fire is about 100 miles away. Do you have a basement or a tiny spare room I can move into??? I’m very quiet and I love green and rain–really. I yearn for 40-60 inches a year but I’m too afraid of subduction quakes to move to the Oregon or Washington coast where they have road signs letting you know when you enter and leave tsunami zones which only makes my mind replay the Japanese disaster. I’d much rather wait for the Greenland ice cap to slide off over your way in Cornwall. I’m headed out now to buy a California Lotto ticket in the desperate hope that I can win enough for May or whoever is PM next week or month to let me in. No basements at all, I’m sorry to say. They just don’t seem to do them around here. Probably because we’re sitting on rock and it’s too hard to dig out. The situation on the West Coast does sound awful. If I could send you some rain, I would. And if you win that lottery, you’ll hear me cheering. Whew. I was in a storm like that once, when I drove cab. I was on the freeway, so that added speed to both the power of the rain itself and the driving. I ended up–passengers and all–pulling off onto the shoulder under a freeway bridge until it let up. It struck me as a dangerous thing to do, but less dangerous than driving half blind and with all the other maniacs on the road driving the same way. I once had to do a similar thing on the (UK) A1 in County Durham. Slowed down to a crawl and then finally stopped as far over to the left as possible, as I couldn’t see a thing through the driving rain. Other cars were passing me doing 60. Were they all being driven by superheroes with X-Ray vision I wonder? Absolutely. They could actually have left the cars behind and flown, but they were worried about getting their capes wet. Cornwall’s no stranger to flash floods of course, the major one of recent times being in Boscastle 2004, which destroyed a big chunk of the village centre. Two friends of mine were holidaying in Cornwall that week and were in Boscastle when it happened. They were ok, but their car, packed with their luggage, was swept out to sea and neither car nor luggage were ever seen again. There’s a conspiracy theory about this disaster, as summarised in this quote from an article in the Guardian newspaper: “The disaster was officially termed “the hand of God” but new evidence from previously classified government files suggests that a team of international scientists working with the RAF was experimenting with artificial rainmaking in southern Britain in the same week and could possibly be implicated.” (https://www.theguardian.com/uk/2001/aug/30/sillyseason.physicalsciences). On a lighter note, we get flash floods on some of the country roads near where I live on the edge of a metropolitan area, and the town types who drive SUVs that are too big for their brains like to drive through them at speed, thinking that their monster vehicles are waterproof. They’re mistaken of course, and water flooding the engine of, say, a £50,000 BMW X5 can cause a lot of very expensive damage. Just waiting to see it happen to one of these pinheads . I’ve seen a lot of photos of flooded cars stranded in places they never should have been, including underpasses. I mean, I know the water can rise quickly, but it sure looks like at least some of them drove in thinking they could get through. In fairness, though, they’re not all SUVs. I didn’t know about the Lynmouth flood, but a friend was in the Visitors’ Centre in Boscastle when the flood hit–she was a volunteer there. As she watched the person before her get winched up into the helicopter, she says she thought, I don’t like that. Then she looked down at the water below her and thought, I don’t like that either, and up she went when her turn came. The last person was winched out after her, and just after that the building collapsed. The amazing thing was that no one in the village died, which is one hell of a tribute to the rescue services. Yes, the rescue effort was amazing, especially considering how quickly the water rose – I mean, “flash” is the best word to describe that flood. It must’ve been terrifying. Someone described the water flowing down the road as looking like a wall of water. I grew up on the high plains of Colorado, which, in some ways is like Texas, especially west Texas. Rains come hard and fast there, and the ground is clay based. Living in these conditions, you learn how to gauge what the water level is, mostly by trial and error at first. You learn to hate basements because they flood so easily. You learn how to swim at an early age. A short comment that sketches out an entire world. When we lived in Minnesota, we bought a house on what used to be a swamp–something we came to understand when our basement did its best to turn back into one after a heavy rain. All along the alley, the neighbors had thrown out carpets from basements they’d converted to living space. I couldn’t imagine a house without a basement, but I came to hate ours. And dread it. Growing up in San Antonio, I got used to seeing measuring poles by every “low water crossing” — dried-up creek beds ~360 days of the year. Then one of those rains would come, and we could track the water rising foot by foot. Never failed, though: every flood, some ninny would decide that a water level just below the 6′-line would be safe to drive into [“I thought it meant 6 INCHES!”], and away they and their car would wash! Someone drove into six feet of water? Worse yet, multiple someones did it? What it wrong with the human race?? Okay, I’ll stop feeling so superior. I just typed “the human rice.” Admittedly, it’s not six feet of water, but it almost got past me. EVERY TIME. Baffling, especially since the poles went up past 7 feet. Did folks think that final inch from 6 to 7 was just A. R E A L L Y. B I G. I N C H?? I dunno, dude. D’ya suppose human rice are smarter than we are? It is not an innate wisdom that has served me particularly well in the soft, lingering rains of the northeast coastline. Nope. Try my approach–especially the part about the bagels. And if I’m in south Texas, I’ll try yours. I only saw rain in a desert once, in Arizona, and it was downright spooky. It seemed like every grain of sand was in motion. I understood–or at least I thought I did–how flash floods happen. I definitely prefer your bagel tactic! Flash foods happen when the skies open like a hole in the ocean — and the ground beneath the topsoil is made of caliche [an impermeable earth, almost clay]. Each time it could take many days before the water figured out where a “downhill” even was. Thanks for that one. It made me laugh out loud. I sometimes wish I could let that downhill writer know how much pleasure his sentence has given me over the years, even if it’s for all the wrong reasons. That’d be unkind, wouldn’t it? I’m not going to get into the stupid things I’ve done as a copy editor, but I will say that I never asked which side of the cake pan to butter. Of course, I never copy edited a cookbook. That probably helped. I believe every editor should keep a list of the best awful sentences they run into. It eases the pain. I began to almost look forward to them. Me too! And have you noticed that the more full of hate and rant a Facebook post is, the more misspellings it has? Actually, I haven’t, but that makes me wnta to misspll all my asnwer. Piran is Cornwall’s patron saint, and also the patron saint of tin miners (tin was historically one of the basic industries here). I don’t think it’s a place name, though. Lots of towns and villages are named after saints, but not after Piran. I had no idea the name appears in Slovenian. As a place name only, or a person as well? (It’s not used as a person’s name anymore.) And the Tamar divides Cornwall from the next county. A kid in the village is named after it, but as far as I know no one else is. Both Piran and Tamar are only place names in Slovenia: Piran (Italian: Pirano, it’s bilingual territory) is a highly picturesque coast town on a peninsula about 60 km from Trieste (and Italy). I’ve got lots of photos from there on my blog since my parents have a house there. Tamar I don’t have on photos, but it’s an equally impressive glacier valley in the Julian Alps close to Planica, a famous ski-jumping venue (which of course means heaps to you :D). Anyway, both highly recommended! And I know I’ll see Cornwall one day, I will! Thanks for that. Cornish is a Celtic language–no longer spoken–and I don’t know enough linguistic history to have any idea whether the overlap is coincidence or history. Either way, it’s interesting.